Inflammatory Bowel disease (IBD) is considered to be the most common cause of vomiting and diarrhea in dogs. It is characterized by chronic inflammation of the gastrointestinal (GI) tract, causing persistent, recurrent signs such as vomiting and diarrhea. The exact cause of this disease is currently unknown, but it is thought that diet, infectious agents, genetics and abnormalities of the immune system play a role. The current treatment for this disease usually involves an elimination (hypoalleregenic) diet as well as daily corticosteroid administrations. However, steroid therapy may cause side effects such as increased thirst, increase urination and weight gain. Furthermore, recent studies have shown that steroid therapy may be associated with a long-term risk of relapse in individual cases. SGM 1019 is a new compound which, in human medicine, seems to provide more targeted therapy of intestinal inflammation to induce clinical disease remission and reduce potential harmful side effects. The purpose of this study is: to test SGM1019’s efficacy on intestinal samples (biopsies) taken from dogs with IBD. If this compound proves to be efficient on ex-vivo samples, this could lead to an actual clinical trial to test if SGM1019 effectively induces clinical remission in dogs with IBD. Your dog qualifies for this study if his/her symptoms are consistent with IBD and if an endoscopy is indicated to confirm the diagnostic. 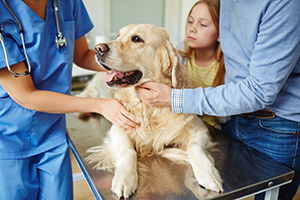 Your dog will undergo GI endoscopy for standard workup during your visit at the hospital, at which time intestinal biopsies (samples) will be taken from the intestines. This is a standard diagnostic method to confirm that your dog has IBD regardless of your involvement in this study. $500 will be deducted from your total bill when your dog is checked out of the hospital.